Awhile back I was at a restaurant. My food was served, but my allotted fork was dirty. I waited patiently for my server to return so I could request a new fork. Eventually, he returned and I made my request. Again, eventually he returned. When I said, “Thank you”, he said, “No problem”. The problem with ‘No problem’ is it creates a problem. First of all, in the scenario I just outlined for you, there was a problem on my end. I was none to happy to have 1) a dirty utensil 2) to wait for a clean fork 3) to eat a cold meal and 4) the server’s job is to serve, so any request is never a problem. I felt as if I should be the one to apologize to him that my fork was dirty and he had to go all the way to the server station to get me a clean one. The nerve of me wanting to eat with a clean fork. When people are upset or if things don’t meet their level of expectation (don’t we all expect a clean fork in a restaurant?) it’s our job as business owners, representatives of an organization or even servers to convey concern and understanding. We care that your fork was dirty. We care that we didn’t meet your expectations. And empathy. We agree with you, a dirty fork is not acceptable. Next it is our job to fix the problem. Get the customer a clean fork- and hurry! Certainly we never want someone to think this level of quality is what they should expect from us. We should be almost embarrassed that a customer got a dirty fork. So it’s our job to make sure we let the customer know their experience is abnormal. We want them to come back, right? It’s much easier to keep customers we already have than to convert people to customers, so we definitely want them coming back. It’s our job to fix the problem and ensure it never happens again. Second of all, the word ‘problem’ has a negative connotation. So in a situation where there was a problem, using the phrase ‘no problem’ doubles the existing problem. And in an instance where there is no problem, use of the phrase ‘no problem’ creates a thought that maybe there is a problem. It’s a little confusing, but a positive situation can be less positive when a negative is added. Dust off your math skills…. a positive plus a negative results in a lower number. 5 + (-3) is the same as 5-3=2. So if you have this really positive experience and then you add the negative phrase ‘no problem’ you lessen the strength of that positive experience. Let’s consider another scenario… I had made my weekly trek to the grocery store -0ne of my least favorite tasks of the week- and I was checking out. Now let’s recap, I had to go to the grocery store. That’s one negative. I made the mistake of going later in the day so checking everything off my list involved dodging carts full of kids and aisles full of stocking carts. That’s two negatives. I had to wait in line. Three negatives. My bill was a couple hundred dollars. Four negatives. So I’m not in a ‘skip through the daisies’ kind of mood, but I’m not angry either. I’m just not my usual happy self. So I get through the ordeal and I pay my bill. The cashier hands me my receipt and my change. I say, ‘Thank you’ she says, ‘my pleasure’. My pleasure! Wow she’s actually happy to help me? She’s pleased to provide me with customer service? Suddenly my mood is lightened a bit. By using a positive phrase, by acknowledging her job is to provide customer service, she actually turned my day around. My pleasure. Love it. In this age of entitlement that we live in, sometimes people forget that their job is to serve. They forget that they need to provide exceptional customer service. Take a minute with each customer contact to be positive, grateful and gracious. Customers are valuable and serving them is never a problem. Over the years I have come across many a small business owner who put all of his eggs in one basket when it came to marketing his business. Sometimes all marketing efforts were focused on advertising. Sometimes it was a website developed by the kid down the street. Sometimes it was a business card. Low and behold time went by and the business owner wondered about the return on investment of his efforts. He’d get frustrated because he didn’t see any results from his single approach effort and then he’d stop marketing all together. ‘Marketing doesn’t work!’ he would say. ‘It’s just a waste of money’ were his cries. Has this been you over the years? Are you frustrated because you want to grow your business, but your marketing efforts never seem to work? I challenge you to consider a multi-branched approach to marketing your business. Advertising, websites, direct mail, networking, brochures, etc are all ways in which you can promote your business. I encourage you to invest in a comprehensive, professional web site as the most important tool in your marketing arsenal save the business card, of course. Once you have a web site, make sure your website provides information about who you are, what your products or services are, how to contact you, why people have purchased from you in the past, and the types of problems your product or service has solved. Next consider how you can spread the word about your business. How can you get your business name in front of the people who are your target customers? Do you know who your target customers are? If not, define your target customers today. Make a list of the ways you can get in front of these target customers. Can you write an article for the newspaper? Is there a specialty magazine you can advertise in? Can you join an association? Join a networking group? Attend a tradeshow? Make a brochure? Sponsor a local team? Word of mouth marketing is the most powerful type of marketing there is. You want people to refer you. So get out there in front of your target audience and develop relationships. Let them know that you are the best person for the job. And once you get in front of them, stay in front of them. They may not need your service now, but they will. Make sure every piece of marketing you put forth includes your web address so when they are ready to buy, they will buy from you. People want to buy from companies that are reliable, dependable and who provide quality and value. Let that company be yours. there would be a snow storm or any of a gazillion other reasons for me NOT to go to a meeting. You name the excuse, I’ve used it. But that was then and this is now. For me, I truly believe in the power of the people. We lived in FishHawk Ranch in Lithia, FL for three years before I started running into people I knew at the grocery store or knew a neighbor I could call in a pinch to let my dogs out if I was running late. What does any of this have to do with running my business, you ask? Well the concepts are the same…. That sounds kind of corny, but it really is about who you know. Association and Chamber memberships provide an opportunity for you to meet other people who might be interested in your product or service. A time will come when the person you met ions ago at a meeting is in need of the product or service you offer and it’s your job to keep your business in front of them until that time comes. I still remember a fellow member from a Chamber in New Hampshire that I belonged to. Even though I did my best to miss as many meetings as I could, I remember this woman. She was a realtor and without fail she was at EVERY meeting. Even the meetings I wasn’t at, I am sure! We’re talking over ten years ago and I still think of her often, not because she was extraordinary in appearance or because she was super outgoing or drew attention to herself, but because she was a constant at the meetings. No Bang For Your Buck? If you join a chamber or association, make sure you are joining one that has members who are your target audience. Don’t get me wrong, it’s good to join an association of like-minded people too so you can stay on top of best practices and have some colleagues to brainstorm with, but I’m talking about joining an association with the purpose of meeting people who want your product or service or who can refer you to people who want your product or service. And once you join… commit to participating! Make your annual membership part of your marketing budget and go go go! Attend each and every meeting you can possibly attend- even if you feel the topic or setting has no value add for you and your business. You never know when you are going to meet someone who needs you! And be sure you bring PLENTY of business cards. Hand out three to each person you meet. One for them to keep and two for them to give away to people who need you. In addition to attending meetings, consider the sponsorship and advertising benefits offered by the association or chamber in your comprehensive marketing plan. The idea is to get your business in front of the captive audience that is your fellow members, as often as possible. Is it time to sponsor an upcoming meeting? How about running an insert in the monthly newsletter? Should you buy a banner ad on the website? Maybe it is time to review the benefits of membership and see how you can leverage this captive audience. Just remember, carrying the membership card is not enough. With memberships, you get what you put into it. If you put nothing into it, you will get nothing in return. Tina Newberry Designs has had the pleasure of managing the website for the New Hampshire Chapter of the National Association of Social Workers. 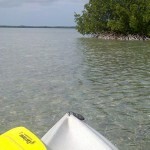 The site has been a conduit of information for new and current members for over ten years. Web technology changes so frequently that best practices dictate web redesigns every 18 to 36 months. 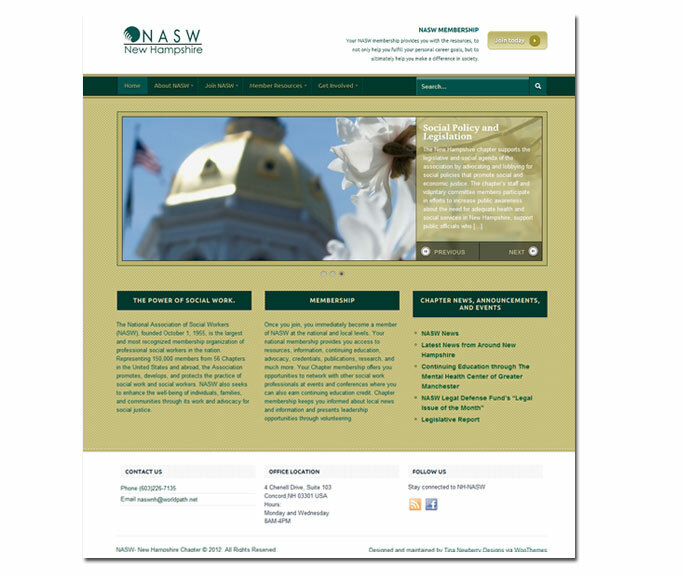 Over time the NASW-NH site has evolved to include even more information, news, continuing education and legislative updates. The recent redesign included upgrading the former static website to a dynamic WordPress driven website. As a result the site now includes search-engine friendly pages, membership features and benefits showcased on the homepage and news and announcements are in the form of a blog for easier search engine indexing and archiving over time. The WordPress platform allows the site to be scalable to easily accommodate more pages, photos, events, news and functionality.